Let’s hope there’s plenty of aspirin at the White House, because the Trump administration has another headache to deal with. Despite weeks of talk of getting tough on leakers, Trump can’t seem to stop his staff from feeding the press juicy tidbits, ranging from reports of internal strife to drafts of upcoming executive orders. 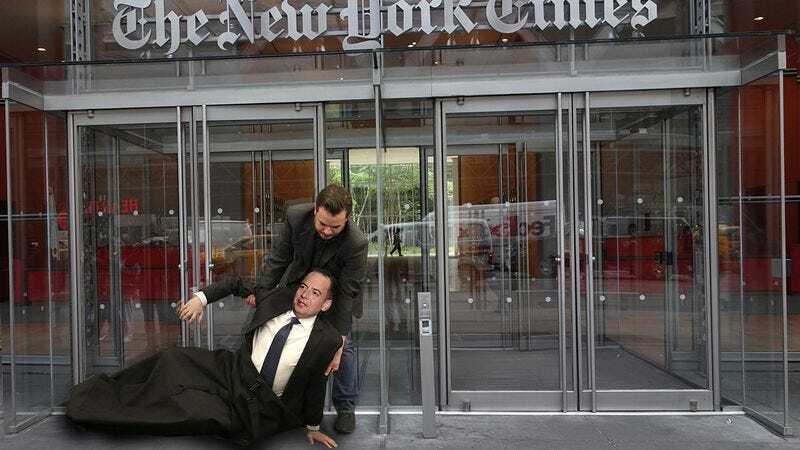 And if this most recent leak is any indication, it’s only going to get worse: An anonymous White House source just sent The New York Times Reince Priebus in a duffel bag. Yikes. Sean Spicer, meet your newest ulcer. The duffel bag arrived at The New York Times Building this morning, addressed to the editorial staff, with only a 1600 Pennsylvania Avenue return address to identify the sender. When opened, the bag proved to contain Reince Priebus in his entirety, a massive and potentially explosive disclosure likely to send shockwaves through the Beltway and beyond. The New York Times has so far refrained from releasing Priebus himself but has confirmed that he is 5-foot-9, pale, and somewhat dehydrated, which White House insiders have taken as confirmation of his veracity. While some outlets might have rushed Priebus out to the public and let them draw their own conclusions, the more cautious Times is clearly treading lightly over the tricky territory of handling the leaked chief of staff. Meanwhile, on the airwaves, Sean Spicer and Kellyanne Conway are in full damage-control mode, insisting that the fact that Priebus was leaked at all is the real story, while deflecting questions about whether this episode may prove harmful to the administration. Indeed, it’s hard to gauge how much of an impact the leaking of the chief of staff will have on the Trump administration, or estimate how much damning info Priebus may contain, if any. Of course, with the Trump administration, it’s only a matter of time before the next round of leaks pushes Reince to the background. So buckle up, because the next four years are only going to get bumpier!